Maize, known as Corn in North America, is one of the three principal cereal grains, with rice and wheat, grown for human and animal consumption. It is also rapidly growing as the cereal of choice for bio-ethanol production in many parts of the world. The Satake VBF Vertical method of dry degermination was launched seven years ago, since then the technology has completely revolutionised the processing of maize. More than 100 system have been installed in southern Africa and many more in the Americas, Asia, Australia and other territories. The Satake VBF system provides superior extraction at reduced fat levels, whilst also eliminating the need for complex gravity separation systems to be installed after the degermination system. The Satake VBF system produces a higher percentage of grits and less flour. It also has the lowest specific energy usage. 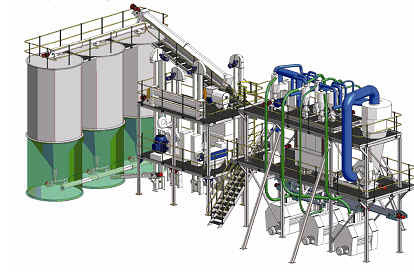 Satake can convert or construct complete maize mills based around our VBF Degerming System. As we look for other industries, which might benefit from debranning technology, our focus turned naturally toward the maize processors, because conventional maize milling already attempts to remove the germ from the maize kernel prior to reduction. We believed that a more efficient and less destructive method of bran and germ removal could lead to overall improvements in the process of milling maize. In this case, our system improves the yield of “yellow” products, with a significant increase in the yield of high value flaking grits. Our new system offers higher yield of low-fat endosperm, and lower levels of fragment, microbial and trace element contamination. Because it produces such high yields of relatively pure endosperm, our degermination system shortens both the purification and reduction processes normally associated. The shorter system fulfils this requirement. The new Satake Maize Degermination Process enhances the efficiency of all of the areas normally associated with dry maize milling, from the production of low fat flaking grits to high quality corn flour to corn starch and ethanol. 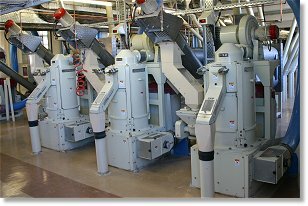 The VBF Degerminator differs from all previous machines by having a vertical configuration, which is the key to its uniform and even action on the grain being processed. It provides an aggressive rubbing action that simultaneously removes both bran and germ from individual maize kernels, while at the same time controlling breakage to produce a maximum number of large pieces of pure endosperm and limiting fines to a minimum. In the degerminator, maize enters the annulus formed by a multiple sided perforated screen and an eccentric shaped rotor. As the rotor turns, the clearance between the rotor and the screen is constantly changing, causing the grain within the annulus to experience alternate periods of compression and relaxation. This produces a very efficient rubbing action, in which bran layers are removed by rubbing grain against grain. In combination with abrasive action resulting from the grain moving across specially designed textured surfaces, this rubbing action simultaneously removes bran and germ from the kernel. The object is for bran and germ to exit the chamber through the perforations in the screen, leaving the clean endosperm to exit at the discharge of the machine. A weighted discharge gate, which can be set manually or automated, is used to regulate the work done and thus the degree of bran and germ removal. Because the clearance between rotor and screen is constantly changing with each rotation, a cyclic compression and relaxation occurs in the grain bed. This produces both the effective rubbing action and the pressure necessary for efficient removal of bran and germ. The VBF's unique vertical configuration allows for uniform loading of grain within the milling chamber. This maximises power efficiency and produces highly uniform bran and germ removal among individual maize kernels. The another key piece of core equipment in our new degermination process is the KB Grain Polisher. Like the VBF, the KB uses an eccentric rotor in a polygonal screen to produce cyclic compression and relaxation. Its long milling chamber, however, allows it to use lower pressures than does the VBF. In addition, its horizontal configuration facilitates movement of individual kernels relative to one another. This makes it an ideal polishing machine. The KB is ideal for the removal of bran only, as is the case when recovery of large germ particles is desired. It is also most suitable for secondary polishing of recovered endosperm. The new degerminating process will produce much higher yields than has been the case using previous, conventional technology. In addition, it allows the possible production of value added products, because the flaking grits produced will have very low fat contents and levels of contaminants, such as insect fragments, microbial activity, insecticide and fertiliser residues. The Satake Modular Maize Mill provides a quick and cost effective way to establish a new or upgrade an existing maize mill. The main modules are delivered as semi-completed units, requiring only the final bolting together and connections to be made. 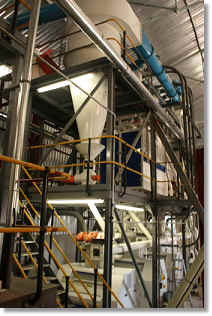 The modular mill designed to run at approximately 6 tonnes per hour.